Mónica Alcoz is a Sr. International Project Manager with SBDC Global in San Antonio, Texas. Under this position, she assists countries interested in establishing sustainable and successful small business assistance networks. Mónica provides in-country certificate trainings to government, private and high education institutions on how to operate and manage successful small business assistance programs. Through her work, she connects the network leaders, center directors and advisors to acquire new knowledge, share best practices and maximize the creation and capture of economic impact. Moreover, Mónica provides in-country technical and certification visits to small business centers, strengthening the integrity, high performance and growth of the networks through continuous improvement. 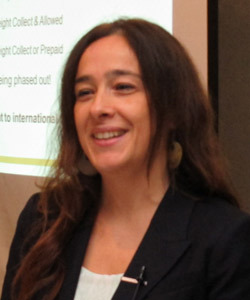 Mónica also promotes export opportunities among small business clients by connecting them with potential international buyers. Since 2003, Mónica has been actively involved in the development and expansion of the U.S. SBDC model in over 20 countries, traveling all through North, Central and South America, the Caribbean and North Africa. In her previous role, she was a Senior International Business Consultant at the International Trade Center (ITC) providing technical support to Texan small and medium size businesses interested in exploring international business opportunities. She was also the Project Manager of the Southern U.S. Trade Association Minority Export Training program, a customized, one-on-one export consulting and training program for high-value food and agricultural companies. Before joining the ITC in 2001, Mónica was an Agricultural Engineer (Ingeniera Agrónoma) working as a crop consultant for farmers in her native country of Uruguay. Mónica holds a Bachelor’s degree in Agricultural Engineering from the Universidad de la República in Uruguay and a Master’s of Business Administration (MBA) in International Business from the University of Texas at San Antonio. Mónica is a Certified Business Advisor (CBA) and a Certified Global Business Professional (CGBP). Mónica is a member of the North America Small Business International Trade Educators Association (NASBITE) and the U.S. Association for Small Business Development Centers (America’s SBDC). Mónica is fluent in English, Spanish, French and Portuguese.